International Space Station’s Canadian Dextre robot moves the RRM Multifunction Tool towards the RRM module on March 8 (Credits: NASA). Tests of tools and techniques for in-space servicing and refueling of satellites has begun on the ISS with the Robotic Refueling Mission (RRM) system, which was delivered to the ISS on the final Shuttle flight in July 2011. The joint NASA-Canadian Space Agency project will use the Dextre robotic two-armed manipulator system, which was built by MDA Space Missions. A top goal is to demonstrate that refueling can be done on a satellite that was not designed for in-space refueling. The first day of RRM operations came to a successful conclusion with the achievement of an important milestone: the successful removal and inspection of three RRM tools from their stowage bays within the RRM module. Comprehensive mechanical and electrical “checkouts” of the Safety Cap Tool, the Wire Cutter and Blanket Manipulation Tool, and the Multifunction Tool resulted in a clean bill of health for each satellite-servicing device. 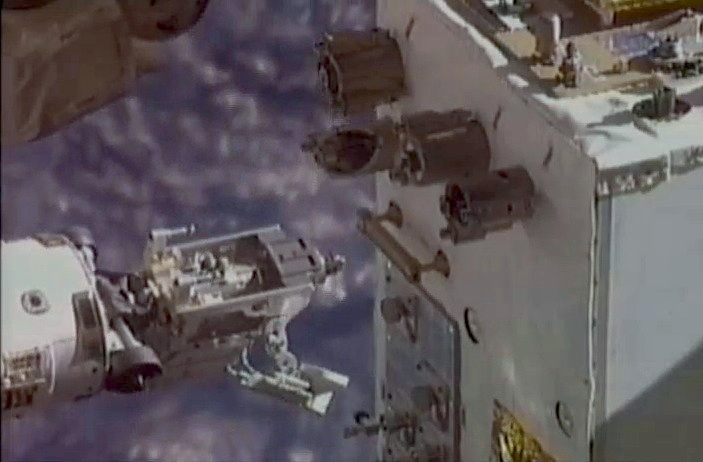 This activity marks the first time that the Canadian Dextre robot has removed an RRM tool from its storage slot. Mission controllers at NASA’s Johnson Space Center seamlessly worked together with teams at the Goddard Space Flight Center, the Marshall Space Flight Center, and the Canadian Space Agency’s control center in St. Hubert, Quebec to accomplish these important initial tasks. This operation is the first part of a Gas Fittings Removal Task in which robot operators at NASA’s Johnson Space Center control Dextre to go through the tasks required to remove fittings that many spacecraft have for prelaunch fluid filling. This task will continue through March 9. In May, Part II of the gas fittings removal task will commence. This technology could one day enable on-orbit refueling, one method by which orbital debris can be deorbited or boosted into graveyard orbits to clear crowded altitudes.